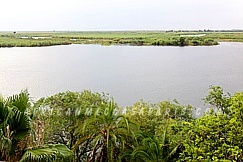 Kasane is located at the edges of the Chobe River bordering Chobe National Park and overlooking the Namibia’s Caprivi Strip. 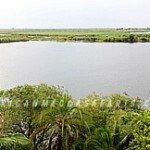 It is near the confluence of Chobe and Zambezi Rivers connecting four corners of Africa i.e. Botswana, Zimbabwe, Zambia and Namibia. It serves as an entry point to the Chobe National Park and a gateway to Victoria Falls of Zimbabwe, Livingstone in Zambia and Caprivi Strip in Namibia. 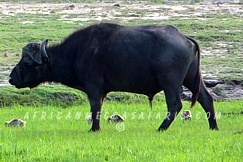 It is likewise an access route to the Savuti, Linyanti, Okavango Delta and other Botswana safari destinations. Kasane serves as an administrative centre of Chobe. In 1975, Kasane gained international fame and popularity when it was made the location of the marriage of Elizabeth Taylor and Richard Burton for the second time. 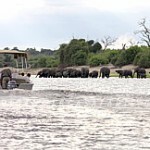 The marriage took place at Chobe Game Lodge – the only riverfront lodge within Chobe National Park. 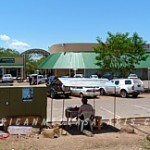 The town may look rural as any small African town, but it is strategically located in that it is an alternate place to stay when visiting Chobe National Park or you can use it to recharge while en-route to other destinations neighbouring Kasane. 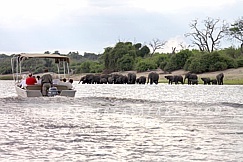 Kasane plays an important role to tourism in the area providing logistical Botswana safari supplies to Chobe National Park and other safari destinations close by. For decades now, visitors enjoy the diversity of Kasane hotels, lodges and camps available to stay while visiting Chobe, Victoria Falls, Caprivi Strip etc. 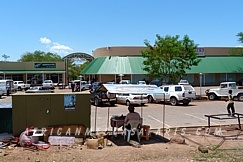 Kasane has a small shopping centre, arts and crafts shops, care hire, vehicle repair shops and banks that cater to locals and tourists alike. A Baobab tree situated at the police station that has an opening at the base of its trunk that can allow entry of a human being is an added attraction of the town. The Baobab tree used to be a prison cell used in the early 20th century by colonial officers. 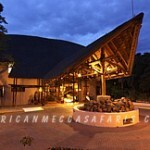 The Kasane Forest Reserve is splendid as campsites offer walking safaris and game drives. There is also the Kasane Hot Springs that is said to have medicinal powers. Kazangula Snake Park offers a reptile encounter of 50 snakes from house snakes to Mambas. Another nearby attraction is the Seboba Water Rapids and Recreational Park, a perfect place to watch the rapids of the Chobe River. There is also the Sibuyu Forest Reserve that is home to the remnants of activities of centuries ago, and also the Crocodile Farm that is 12 km from Kasane offering education tours within its premises. Aside from the Chobe safaris (game drives), there are plenty of other activities that you can enjoy in Kasane from boat cruises along the Chobe Riverfront to day trips to the thundering Victoria Falls to river fishing on the Namibian waters and many more. 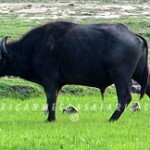 You will enjoy the view of magnificent natural habitat and witness at close range the varied species of game. 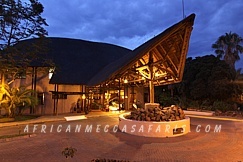 AfricanMecca guests staying at Botswana hotels in Kasane have all their preferred tours prearranged to ensure a perfect and seamless Botswana tour experience while enjoying of the beauties of Kasane and Chobe safaris in Africa.